The Atturo AZ850 performance radial is designed to give drivers of luxury-performance SUV and CUV vehicles a reasonably priced replacement alternative to expensive original-equipment tires without sacrificing performance or ride comfort. The asymmetric tread design features different inner and outer tread contours to achieve an optimum balance across the tread face for an even distribution of contact surface pressure. Four main longitudinal grooves combined with oblique lateral grooves allow water to disperse for increased wet grip and reduced hydroplaning. A continuous center rib improves directional stability at highway speeds. 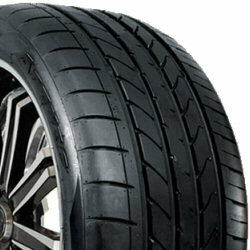 The unique compound of the AZ850 helps reduce rolling resistance which allows the tire to run cooler at high speed. High-tensile steel belts and jointless nylon bands increase stability at high speeds and provide secure braking, handling and durability. A jointless bead wire and high bead filler enhance both tire rigidity and cornering stability for spirited performance driving. Available in run-flat (RFT) sizes where noted. Y or V speed ratings available. The Atturo AZ850 is available in 18 through 22 inch wheel sizes and 35 through 60 series aspect ratios.